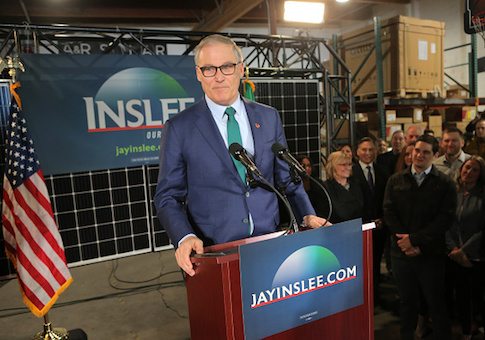 Democratic presidential candidate Jay Inslee said humanity is down to one last "chance at survival" because of climate change. Campaigning in New Hampshire, the single-issue Democrat called for a "full-scale, full-throated" response to combating the weather. "We have exactly one chance left to defeat climate change—and that's during the next administration," Inslee said during a living room stop in Bedford, N.H., over the weekend, the Guardian reported. "And when you have one chance at survival, we ought to take it," he said. Inslee took swipes at his fellow democratic candidates for not making climate change their biggest priority, though Bernie Sanders, Cory Booker, Beto O'Rourke, Elizabeth Warren, Kamala Harris have all endorsed the Green New Deal. The Green New Deal calls for the "economic transformation" of the United States, reparations, retrofitting every building in the country, a jobs guarantee with health care, paid vacation, and retirement benefits, and the complete overhaul of transportation systems in order to eliminate carbon emissions in 10 years. Residents would have "access to nature" under the plan. "I wonder the difference between talk and action," Inslee said. "Between bumper stickers and productive accomplishments." "It can't be just one of those things on your to-do list," he added. "It has to be a full-scale, full-throated commitment to get this job done." Both Booker and O'Rourke have likened fighting climate change to fighting the Nazis during World War II. While Inslee insists humanity has one final chance at survival, other Democrats have suggested people should stop having children in response to climate change. This entry was posted in Politics and tagged 2020 Election, Climate Change, Green New Deal, Jay Inslee. Bookmark the permalink.